Quality is our only job. As unsettling as a car accident can be, the aftermath can also be incredibly stressful and confusing. At the auto body shop of Williams Body & Paint, we take the stress out of auto body repair. Our full-service auto body shop in Colorado Springs will work with your insurance company to restore your vehicle to its pre-accident condition. Here at Williams Body & Paint auto body shop, we’ll guide you through our full-service auto body repair process seamlessly. Assess all damage prior to starting repairs. With Williams Body & Paint, you’ll be driving your car again sooner – and with the quality assurance the job was done right. Williams Body & Paint auto body shop is a locally owned and operated full-service auto body repair shop in Colorado Springs, offering you efficient and affordable total collision repairs. Our owner is a U. S. Veteran, and we make a point of providing high-quality service to our Military customers. At Williams Body & Paint, you can trust that your vehicle will be in the best hands. Come by to talk to us about an estimate, call us at 719-638-4849, to start getting your car or truck back to normal. Thank you to all who participated in voting! 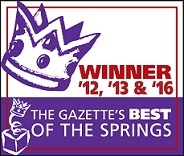 Williams Body & Paint won Gold for The Best of the Springs!